Toshiba has shown off its first 3D TV at the Toshiba World Forum in Rome this week, with the company deciding to use passive 3D for its mid-range televisions. The Regza VL series offer "sharp, vivid, lifelike 3D pictures with incredible depth and accuracy, with four pairs of polarised ReaID 3D glasses". More and more TV manufacturers are looking to polarised 3D for TV, with Toshiba following in the footsteps of LG and Philips. 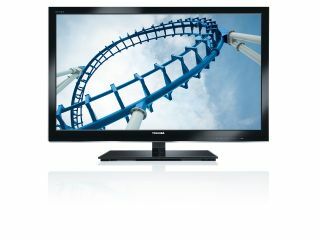 The Regza VL series offers 42-inch and 47-inch televisions and comes with Edge LED backlighting. As the 3D is passive, the glasses are cheap – so Toshiba is bundling four pairs of RealD glasses into the package. The TV also comes with access to Toshiba Places, Resolution+ technology and has a built-in subwoofer.If you buy an external dongle, you can also get Wireless LAN on to the device. Connectivity includes 4x HDMI, Regza-link and there's also Freeview HD on board. Unfortunately there's no Regza VL series UK release date as yet and pricing is still to be announced.